On my way back from the Okefenokee Swamp and Cumberland Island, I decided to visit the Moody Forest near Baxley, Georgia at Peter Essick's suggestion. I was so ecstatic that I did. I only saw one person the whole time I was in the forest. We met near the beginning of the trail. He'd moved about an hour away for a job and frequently hiked in the forest. He said I was the only other person he'd ever seen on the trail. Being there was like being in some primeval paradise. When I got into this one section with these towering virgin longleaf pines estimated to be 200-300 years old or more, I had to lie down on my back and look up in awe. While I was photographing the pines, I was captivated by their tall trunks and sinuous branches and visualized them monochromatically. Their elegance was magnificent. This is one of the last old growth virgin forests in the country. 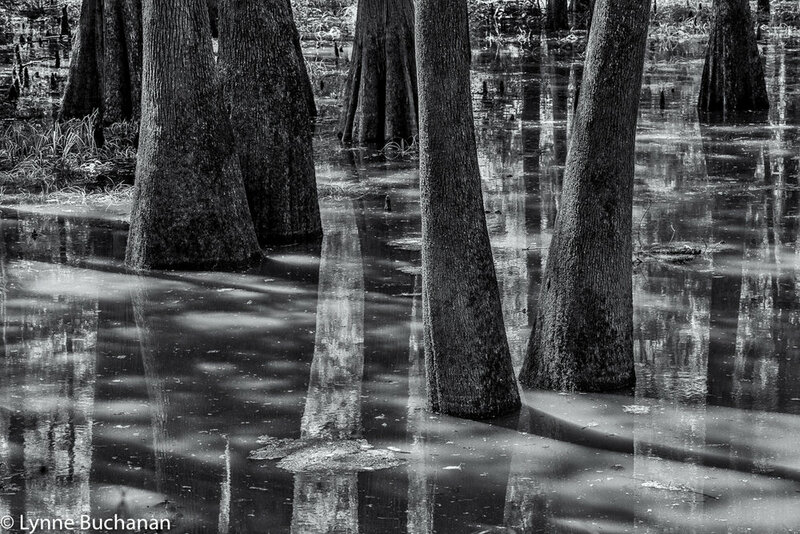 Many forests in the south were comprised of these trees, but most have been logged. In 2002, the Nature Conservancy of Georgia, the state Department of Natural Resources and others donors purchased the 4,500-acres that constitute this forest for $8.25 million, making it one of Georgia's most valued conservation feats. I still can't believe that I was able to spend four hours walking around there taking this all in. Sadly, today many of our National Parks, forests, and other natural sanctuaries are viewed as resources to mine, log, and otherwise make money from. The problem is that a forest like this took hundreds of years to grow, and once destroyed the ecosystem will never be like this again. It does something to a person to be alone in a pristine place like this too. It makes you realize your place as a mere point in Indra's net but also as a sentient being capable of appreciating such grandeur and cognizant of the richness of life it provides habitat for. Dare I say I see God in trees like this. The trees in the Tupelo and Cypress slough in the Moody Forest are estimated to be approximately 600 years old. To me, these trees are the eastern version of the redwoods and giant sequoias. They were here before the Pilgrims landed and white men began despoiling America's wilderness. Standing among these trees, I felt the longevity of natural cycles and a sense of permanence that is ever more elusive in modern times. Often this area is dry enough to walk around the hiker told me, but there had been some heavy rains the preceding week and a lot of water was still present to reflect the tree trunks and the shadows they cast. It was like peering into a maze. The state of Georgia has been able to preserve this gem because three siblings inherited what locals referred to as the Moody Swamp from their uncle Jake Moody. He left them this land with the stipulation that it not be logged or developed. While the siblings were alive, they protected the land. Two years after the last one died in 1999, the heirs old 3,500 acres to the Nature Conservancy. An additional 1,000 were later protected as well. This is what I call a great legacy.